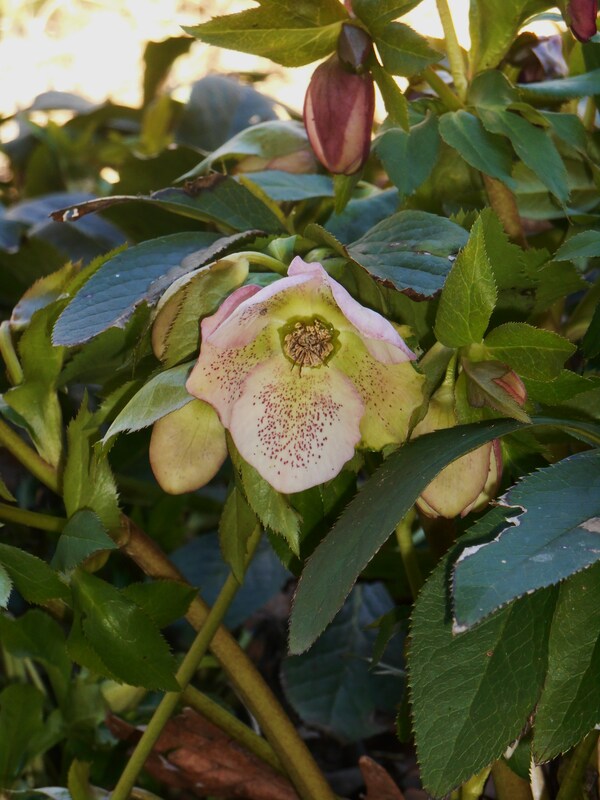 Hellebores begin their grow in the middle of winter, sending up fresh new leaves and flower scapes under cover of their sturdy, evergreen leaves left standing from the previous season. 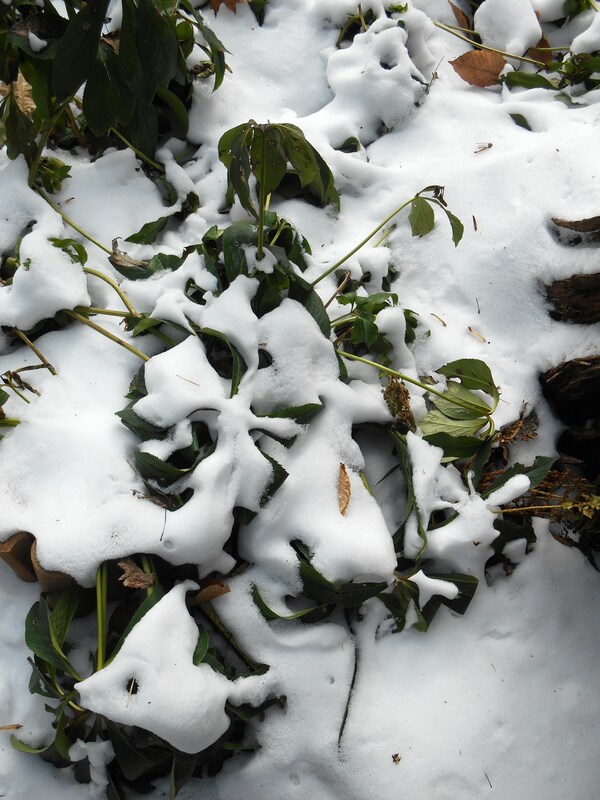 These thick, protective leaves offer cover from freezing temperatures, snow, ice, and winter winds. 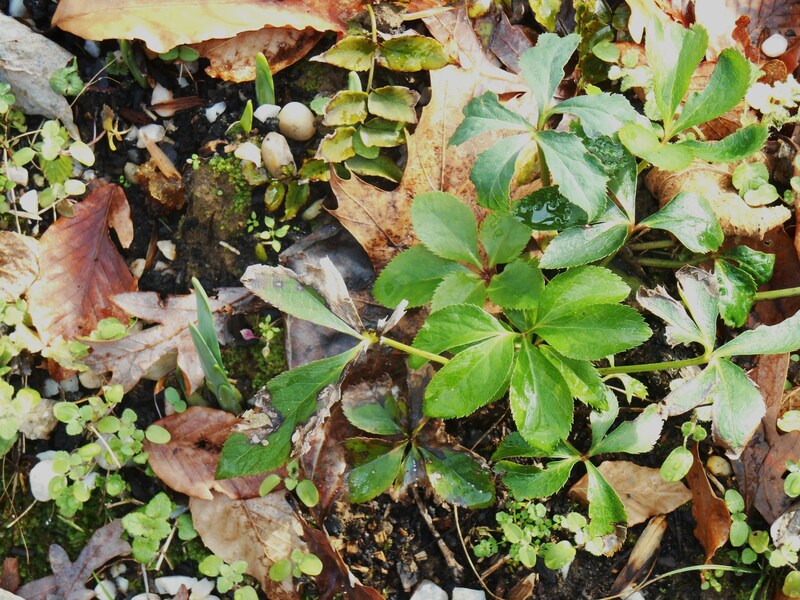 Although they may begin to look a bit ragged by February, Helleborus leaves are still vibrantly green in our garden. It is only when these long, thick leaves are finally cut away that the dazzling jewel like buds of the new season’s flowers finally shine. Within just a few days of removing the cover of old leaves, light reaches the new growth, causing it to lengthen and the buds to open. New flowers and leaves will soon fill out the display. Hellebores are hardy perennials, growing in moist shady spots in zones 5-8. Native to much of Northern Europe from the British Isles eastwards to Turkey, the original species have been heavily hybridized to produce countless different combinations of form and color. 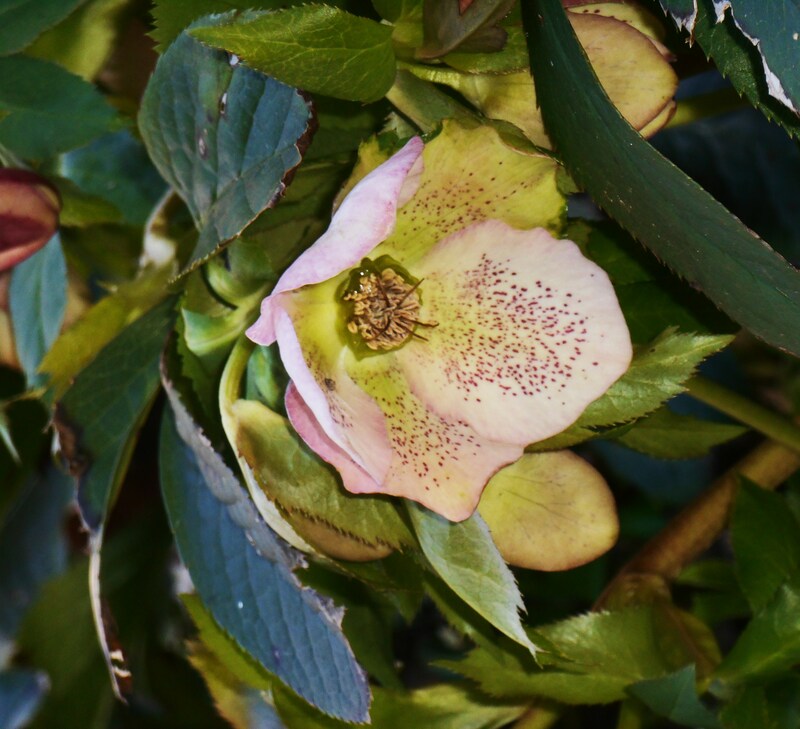 Although often called “Christmas Rose” and “Lenten Rose” for their season of bloom, the 20 or so species of Helleborus are not related at all to roses. Rather, their common name refers to the open rosette shape of their bloom when fully open. Hellebore blossoms are only fully appreciated when viewed up close. Most cultivars hold their blossoms facing downwards. One must come in close and lift each blossom to see its face. 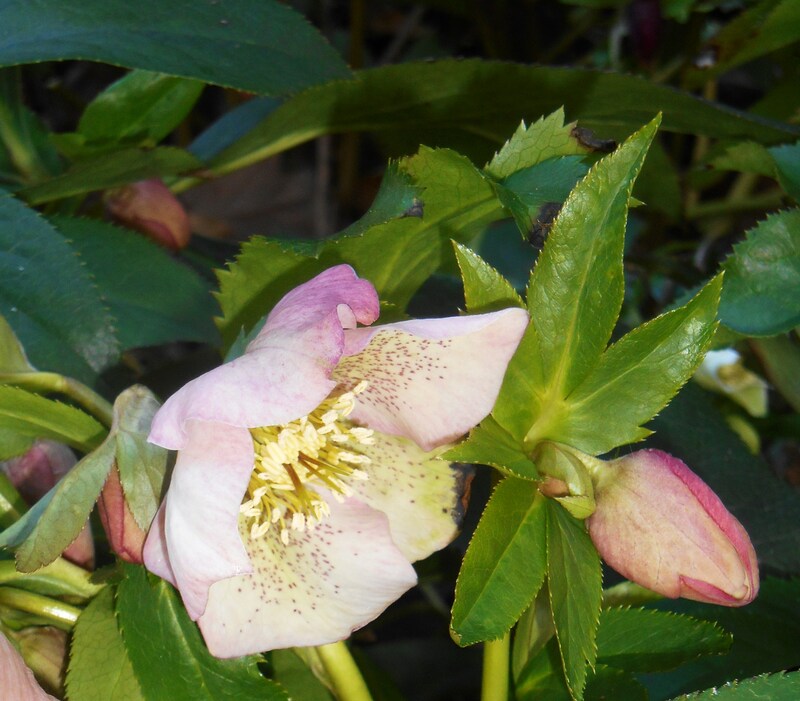 Most Helleborus blossoms bloom in shades of white, cream, pink, peach, lilac, burgundy, or dark purple. Many have “freckles” on their faces. Some Helleborus flowers are entirely green, including H. odorus and the beautiful H. foetidus. Others, may be a shade of green with pink or purple markings. Although Hellebores are widely available through mail order nurseries, this is one plant I prefer to buy in person, when it is in bloom. I want to see the flower and buy a sturdy, well developed plant. I’ve planted Hellebores in pots during the winter, with Violas and evergreen fern, in full sun areas. It is important to lift and transplant these Hellebores to mostly shady areas before the middle of May, in our area, so the plant isn’t burned by the summer sun. 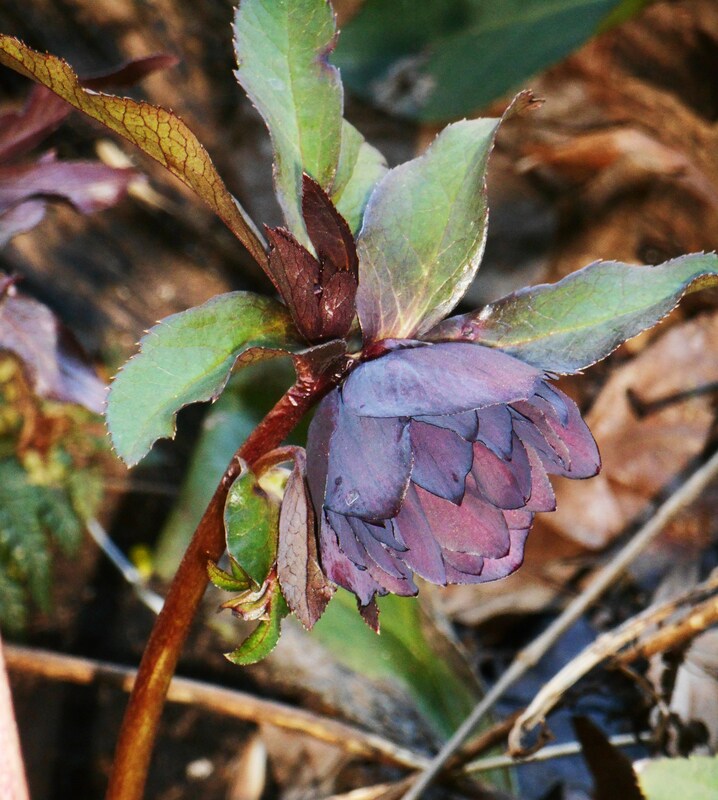 One of the prettiest Hellebores, with variegated foliage, is H. argutifolius ‘Snow Fever.’ Its new leaves and flower buds emerge tipped in pink. Its creamy flowers have a cast of light green. This one has not proven as reliably hardy in a pot as H. orientalis, but it remains worth the effort. Hellebores enjoy winter and spring sunshine, but appreciate the leafy canopy of trees during the summer. They grow well in partial shade under large shrubs or deciduous trees. If planted under a tree, make sure the plant gets sufficient moisture all summer. Thirsty tree roots often grow up into plantings and rob the perennials of needed moisture when the beds aren’t kept well watered. I lost two beautiful Hellebores last year by transplanting them in late spring, under trees, and not keeping them well watered through the entire season. I also planted them a little too high. The crown of the plant should be at, or slightly below ground level, and the area around the roots well mulched. This two year old seedling was transplanted into a fern bed last summer. Many of the Hellebores available at nurseries are hybrids, and so the seedlings won’t match the parent plants. Hellebores do set great quantities of viable seeds, and so you’ll find hundreds of little seedlings coming up nearby. These can be transplanted in spring, cared for, and grown out to see what flowers will develop. Don’t expect seedlings to reproduce the flowers on an expensive hybrid, but do give the plant a chance. You may be pleasantly surprised with the flowers which do develop. There are so many seedlings from a mature plant that you have plenty to generously share with gardening friends and to expand your own collection. 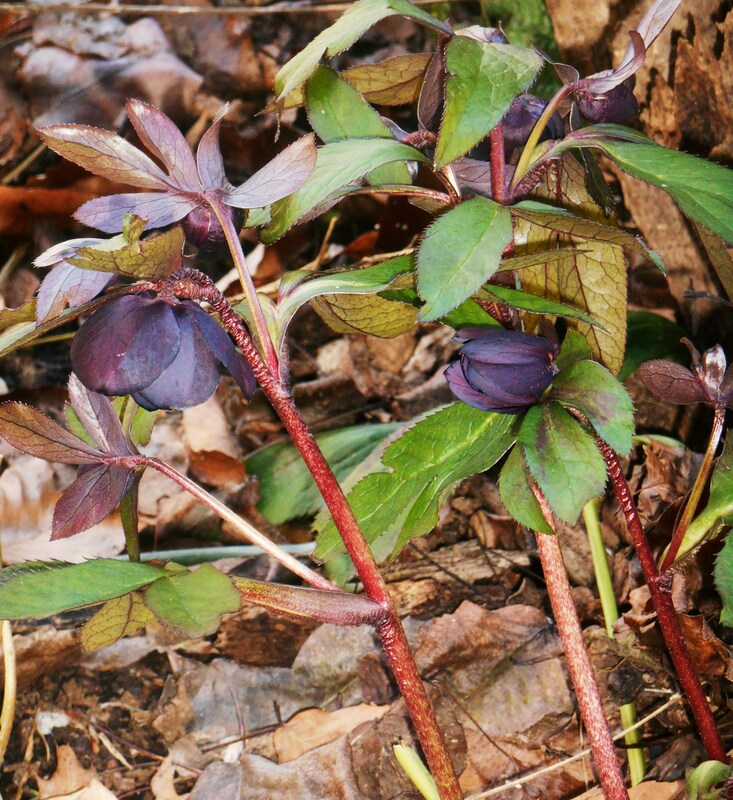 Helleborus hybrids can be found in many unusual colors. 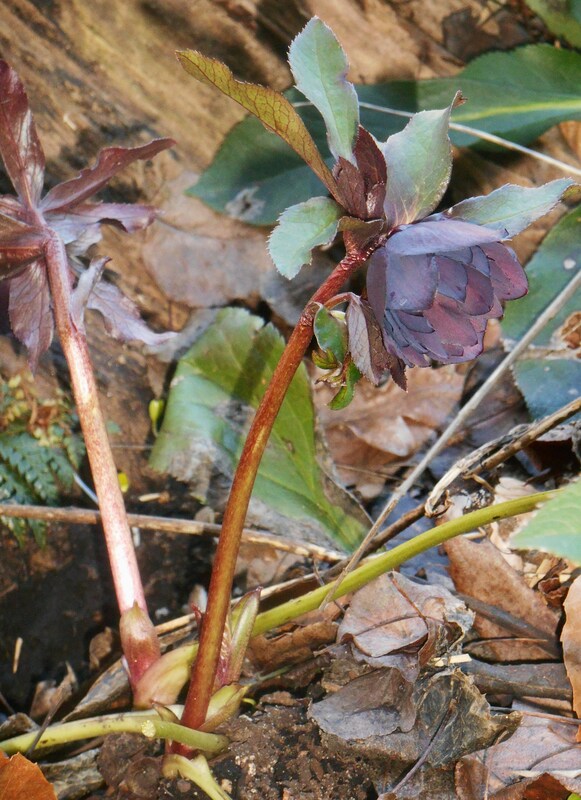 Every part of a Helleborus plant is poisonous, from flower to root. This means they won’t be nibbled by voles or deer. Spread the older leaves you cut away on the ground anywhere you are troubled by moles or voles, and the poisonous alkaloids will be transferred to the soil. It is wise to wear gloves when planting Hellebores, trimming their leaves, or cutting their flowers. My first Hellebores were a gift from a dear friend who grows a yard full of them. We dug dozens of seedlings from her garden one day in early summer, and I brought them home and tucked them into new raised beds I was building. They took off in the rich compost, quickly filling the bed. Sadly, where I tucked seedlings into the ground without first building up a new bed of compost, they struggled. The seedlings planted into a well prepared bed bloomed the following spring. Those planted in other areas did not. Hellebores tend to be more expensive than some other perennials because they don’t bloom their first year. When you buy a plant in bloom, it is already several years old. If transplanting your own seedlings, expect a few years of foliage only before the first flowers appear. Hellebores form wonderful ground cover in shady areas, and require very little care. Although they look unremarkable during much of the year, their winter and early spring bloom make them well worth the effort. By planting several different varieties you can enjoy Helleborus blooms from December through May. I’ve noticed that most of the best gardeners in our community grow Hellebores. 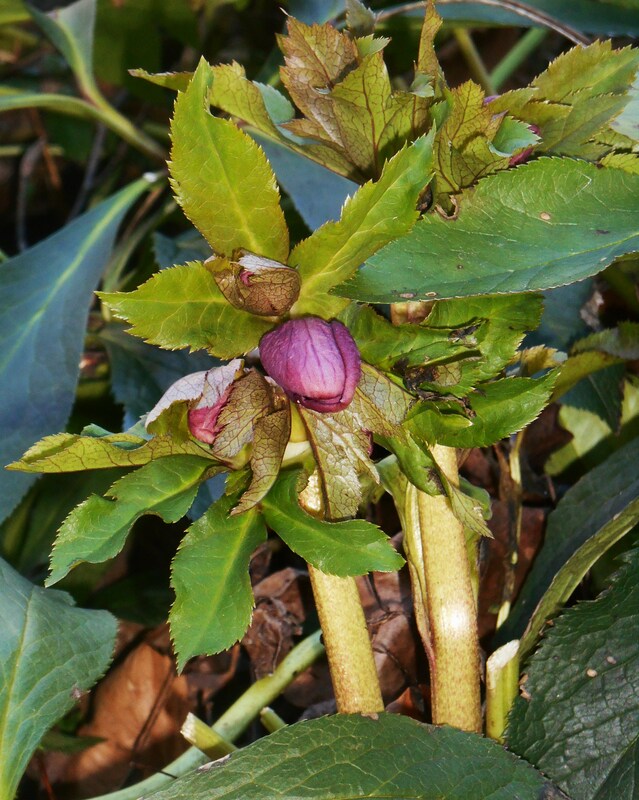 Many cultivars of Helleborus, especially H. odoratus, grow well in the conditions our gardens offer. In fact, they are on the “short list” of flowering perennials which thrive here. Mix Hellebores with ferns, mosses, Hostas, Epimediums, Brunnera, and other shade loving perennials. Once past their bloom, the Hellebores leaves will form a solid backdrop for other plants throughout the summer. Cut, Hellebores last for a long time in the vase. One of the few cut flowers we can grow here in Zone 7b during the winter, they work well in arrangements with early daffodils and forced flowering branches of shrubs or fruit trees. Hellebores are another heritage plant which continue year to year with little effort from the gardener. Trimming their old leaves, keeping them watered, and feeding once or twice each year with a mulch of compost is all they really require if planted in the proper spot in the garden. They reward this little effort with lovely jewel like flowers when we most need them, during these last few frosty weeks of late winter and earliest spring.